Berlin-based indie natural brand April Aromatics has launched Erdenstern, a new unisex perfume. The mystery of Avalon, the holy place between the worlds of gods and mortals, is the inspiration for Earth Star. The “Earth Star”/ Erdenstern symbolizes this connection and provides a conduit between these two worlds. Based on the Autumnal mood in November; Earth Star/ Erdenstern shimmers through wet leaves within mystical landscapes. 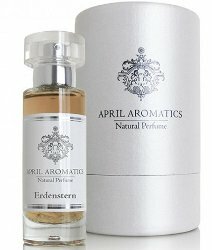 April Aromatics Erdenstern can be found now at Luckyscent, $225 for 30 ml Eau de Parfum.